These Nitrile Gloves are latex free and have an extended cuff to protect the wrist and part of the arm. These gloves are ideal for cold process soap makers as it protects an extended area from chemicals. Size Small. 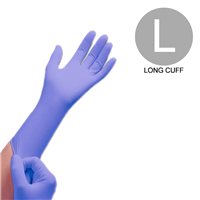 Nitrile Gloves with long cuff are one time use only. Wash and dry hands. Slide glove completely onto both hands when working with products. Gloves should be comfortable but tight. COMMENTS: I was really happy with the longer cuffs on these gloves. Very helpful when trying to keep bath bomb mix from falling down into your gloves. "What is the thickness in mm?" Staff Answer They are 4-mil thick in the palm, 5-mil thick in the finger and are 12" long.